MISSION — Before a procession of protesters made its way to the National Butterfly Center here, Duwayne Redwater of the Standing Rock Sioux Tribe, Lakota, Dakota, sang a song of encouragement. Redwater, 24, was among nearly 40 people gathered near Chimney Park Monday morning to protest the arrival of construction materials, such as heavy machinery, to build border wall fencing in the area. 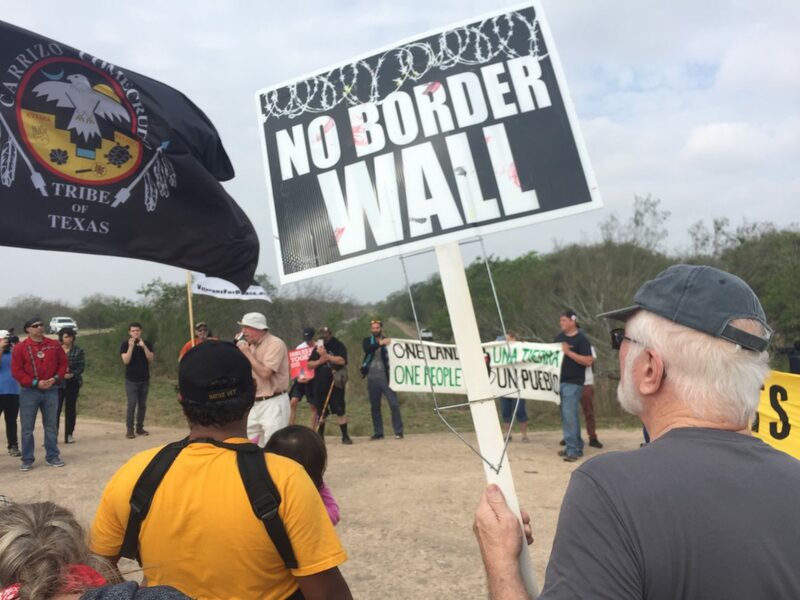 Here, near the Rio Grande, members of the Carrizo/Comecrudo Tribe along with other opponents of wall construction convened before they made their way about three miles down to the National Butterfly Center to march in protest. The tribe described the protest as a walk to call national attention to human rights violations and the possible desecration of local refuge sites, indigenous burial grounds and private property as the government moves forward in preparation for border wall construction in the area. The group of protestors waved flags and chanted before embarking on the three-mile trek from the area near Chimney Park to the National Butterfly Center. The equipment arrived Sunday afternoon just days after U.S. Customs and Border Protection officials announced that bulldozers and other heavy equipment were going to be arriving as soon as Monday, marking the official start of the government’s efforts to build physical barriers along the levees in Mission. Congress approved the funding last March as part of a $1.3 trillion omnibus bill that gave money for 25 miles of levee wall fencing in Hidalgo County and 8 or so miles in Starr County. During a media event Monday, U.S. Rep. Henry Cuellar, D-Laredo, who just last week introduced a potential border security proposal that included language that may prevent construction on environmentally sensitive areas, including the butterfly center, reiterated his efforts to stop the already funded 25 miles of border wall construction in Hidalgo County as part of the 2018 omnibus bill. Monday’s show of protest is the latest in a series of demonstrations that began in the summer of 2017, when the center’s executive director, Marianna Treviño-Wright, discovered federal contractors on the butterfly center’s land. This was the first indication that the area was slated for construction. Treviño-Wright, who came upon the contractors back in July 2017, was in attendance at the protest and said they had been made aware of the heavy equipment arriving as of Sunday. She said the equipment was set up and placed on land northwest of the center’s property after initially being delivered to Bentsen-Rio Grande Valley State Park but denied entry by staff. There has been no update, she said Monday, with respect to lawsuits filed on the center’s behalf last year in an effort to stop the proposed construction. She described reports of law enforcement in and around the center Sunday afternoon going into the evening, adding that members witnessed law enforcement patrolling the area, including Texas Department of Public Safety troopers, Mission police and U.S. Border Patrol agents. At least one Mission police officer talked to that member and said he had to enforce orders preventing anyone to access the levees, she noted, and that the levees were closed and — effective Monday — was “all government land,” and that no one would be able to cross the levees or access them. She said the construction’s impact on the property would be immeasurable. Jeffrey Glassberg, the National Butterfly Center’s president who was also in attendance at the protest, addressed its participants while speaking on the very levee where construction is expected. He said an emergency restraining order could be filed against the government as early as this week to stop the eminent construction. The crowd at the protest was a peaceful group who chanted during their hike up to the levees behind the center. At one point, while protesters had gathered on the butterfly center’s levee, two U.S. Border Patrol agents on horseback came upon the group, making their way around them after a few pleasant interactions between the marchers and the horses. Treviño-Wright collapsed into the arms of a fellow butterfly center colleague, as she broke down in tears. Redwater, who had just performed another brief song along the levee, approached and greeted a couple of U.S. Border Patrol agents on horseback who came upon the protest. A member of the Standing Rock tribe, Redwater made conversation with the agents and approached the horses before they continued along the levee and away from the butterfly center. We’re live at the National Butterfly Center where tribes are protesting on the levee in Mission where the border Wall is planned to be constructed.Facebook Live videos may contain vulgar language as they are shot live. Juan Mancias, a member of the Carrizo/Comecrudo Tribe, said that on Sunday afternoon he and a group arrived in Mission to visit Montezuma’s Cypress Tree. There, he said they were approached by county, state and federal authorities. The 900-year-old tree, considered to be the “grandfather” of all trees in South Texas, stands a half-mile down an unmarked dirt road in Mission, past a set of houses and behind a levee wall, which as of now still allows for the general public to access the land behind the fence. Mancias said authorities told them they were trespassing on federal land. The news was met with condemnation from other environmentalists, including officials with the Center for Biological Diversity, a conservation group based in Tucson. The group filed lawsuits last year challenging the land waivers the administration executed in its efforts to build physical barriers along the U.S.-Mexico border. Attorneys for the Center for Biological Diversity sued the Trump administration to challenge waivers ignoring dozens of environmental, health and safety laws to speed border wall construction near the Santa Teresa Port of Entry in New Mexico and California as well. Those cases and the one in Texas are still pending in federal court. Patricia Rubio, one of the last protestors to speak during the event and a former volunteer at the butterfly center, became emotional discussing the work volunteers and staff at the center did on a daily basis to maintain the habitats on the property. Monitor staff writer J. Edward Moreno contributed to this report.